The Claudio De Simone Formulation is a probiotic medical food that is made of living bacteria. The key strains in this De Simone Formulation are propriety, and so are the manufacturing processes and the precise ratios of strains necessary to confer benefit as a medical food. Professor Claudio De Simone, M.D. invented a proprietary blend of probiotic strains and collaborated with VSL Pharmaceuticals, Inc. in the mid 1990s. They produced and marketed the invention that was known as “VSL#3®*” which is a trademark owned by VSL Pharmaceuticals, Inc. In 2014, Professor De Simone decided to leave VSL Pharmaceuticals and he is now collaborating with ExeGi Pharma, LLC to produce his own probiotic called Visbiome. This probiotic uses the same proprietary blend of probiotic strains and manufacturing technology that De Simone originally invented (the “De Simone Formulation”). Please note that after February 1st 2016 the De Simone Formulation is available as Visbiome. Visbiome should not be used in premature infants in the Neonatal Intensive Care Unit (NICU) setting. 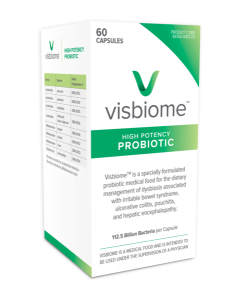 Users may experience bloating during the first few days after starting Visbiome as there is an intestinal microflora change. If this does occur, it may be necessary to reduce daily consumption so as to allow for adjustment. You may consult with your health care provider if you are experiencing bloating. Its best to avoid taking Visbiome with antibiotics. It is possible for some antibiotics to inactivate certain strains of bacterium in Visbiome™. *VSL#3® is a registered trademark of VSL Pharmaceuticals, Inc. and is manufactured exclusively for, VSL Pharmaceuticals, Inc. Visbiome is manufactured exclusively for ExeGi Pharma, LLC and is not affiliated with, endorsed by, or distributed by VSL Pharmaceuticals, Inc.